Quickly create and configure mesh surfaces from bezier curves. Ideal for creating accurate machine parts or for more organic modelling. Choose to create meshes from 1, 2 or 4 curves with a customisable number of cuts in each direction that are evenly distributed by default. 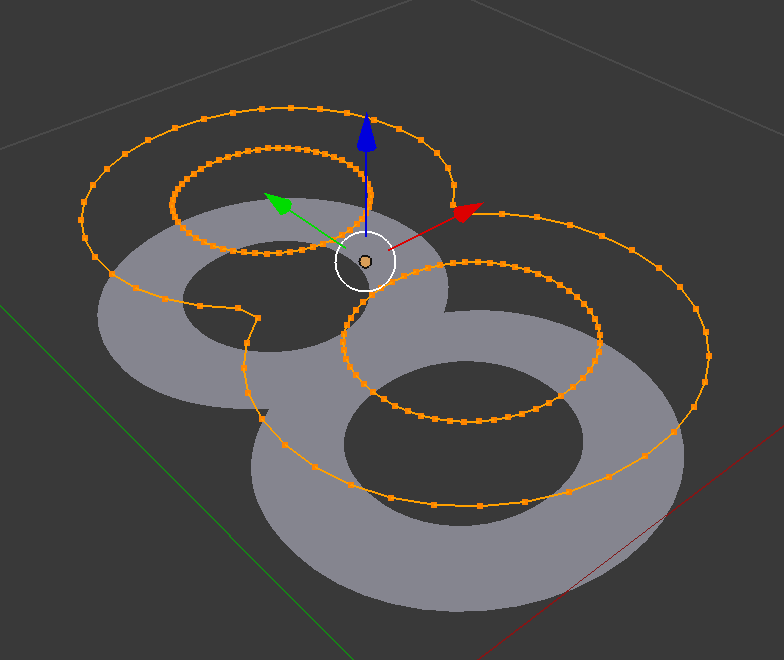 Meshes can be created from curves with multiple bezier points. An edge-loop mesh can be created from a singular curve. Curves can be cyclic (joined up in a loop) or non-cyclic. Works on curves with multiple bezier points. Useful when you need to create accurate pieces of a mesh, like an aircraft, or for more organic shapes. Faces can be set to smooth or have their normals flipped during the creation process. A network of curves could be built up to create more complex objects. Can be used as a complement to more traditional modelling techniques. By default the edges will be distributed evenly, but this effect can be reduced (see instructions). Compatible with my other add-ons such as the Plating Generator, Bevelled Extrude and Window Generator. I have now upgraded the add-on for 2.8 beta and put it ready for download alongside the 2.7 version. You will be able to tell the 2.8 zip file version because it ends in 2.8! I'll be updating the documentation once 2.8 becomes the main Blender release. 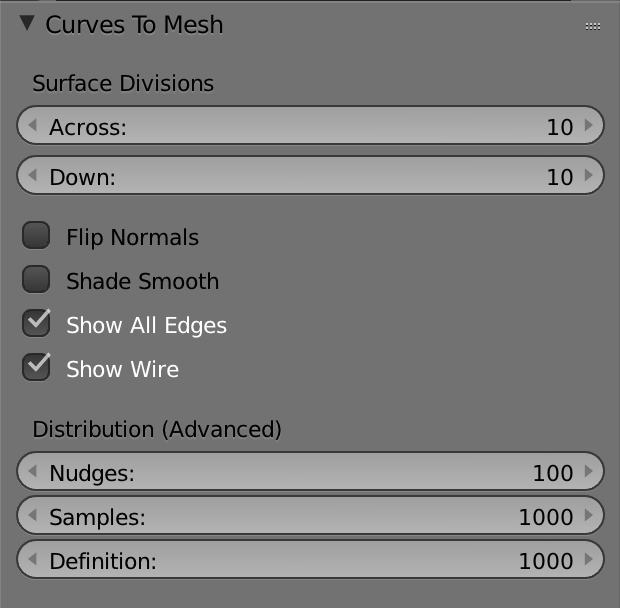 New Feature: You now have an additional option called Curve Profiles To Mesh which will allow you to select multiple curves and create a mesh from the edge loops. See the documentation for instructions. 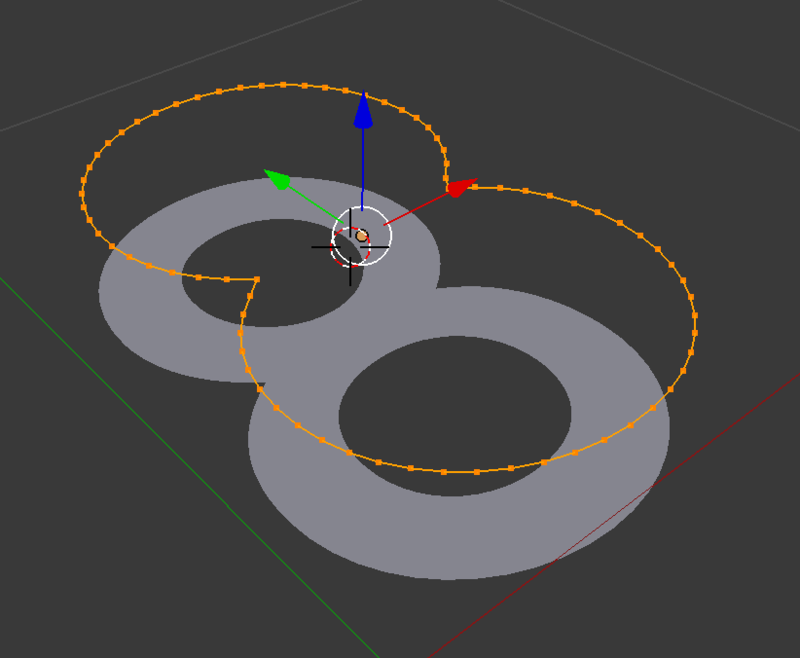 Fixes: When selecting a curve that has multiple splines, such as the figure 8, the add-on did not create all the shapes. This has now been fixed when selecting one curve object. The add-on can either be installed through the Blender UI or by unzipping the file into your add-ons directory. 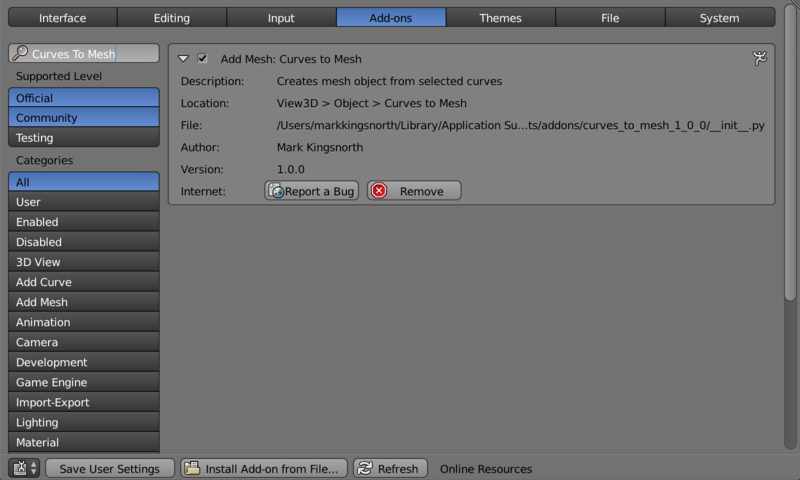 Search for the add-on by typing "Curves to Mesh" in the search box if it does not already appear. Make sure the checkbox next to the Add-on (Add Mesh: Curves to Mesh) is ticked. Unzip the contents of the .zip fine into your scripts/addons directory. 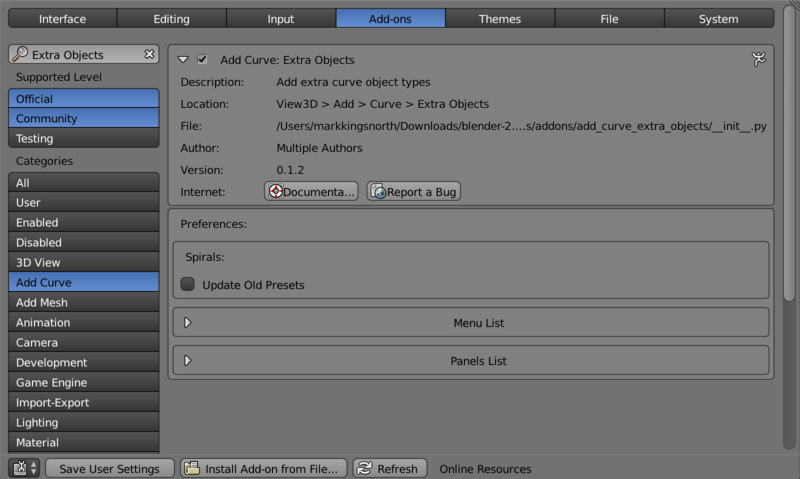 The curves_to_mesh folder should be created within this directory. Go to File-> User Preferences. Creating a set of evenly distributed vertices and edges along the curve(s) you have selected to create an edge loop. If more than one curve is selected, the edge loops will be joined using either a Bridge Edge Loops or Grid Fill operation. Optionally apply a smooth operation on the faces as well as the option to flip normals. The add-on distributes the vertices evenly along the curve. This ensures that, when creating a surface, the vertices are connected across edges as smoothly as possible. This is different from the standard Blender conversion of curves to mesh objects which does not distribute vertices evenly. The distribution algorithm nudges the vertices along the curve until they are equally distanced from one another. This feature does have a performance impact on more complex curves - to disable the feature, set the nudges parameter to 0. Select the curve or curves. Press Space and type "Curves to Mesh" and select the option. Select "Curves to Mesh" under Object -> Curves to Mesh. This is the number of cuts to be made across or down a mesh. Across: The number of cuts across a mesh surface. Flip Normals: Flip the faces of the mesh. Shade Smooth: Apply smooth shading to the faces of a mesh. Show All Edges: When creating a mesh, all the edges will be shown in the wireframe view. Show Wire: The full wireframe will be show even in Solid view mode. These parameters do not normally need to be changed. They control how the vertices get distributed along a curve. It is a non-trivial maths problem to evenly distribute the vertices, as the nature of a Bezier curve is designed to put more vertices along more pronounced part of it. The add-on distributes the vertices along the curve by nudging them along for a set number of times, attempting to make the vertices equally spaced each time. Nudges: number of times each vertex is nudges along the curve. Note: By setting the parameter to zero, vertices will be distributed in a more Bezier like fashion. Samples: Number of samples between vertices to nudge them along by. Definition: How well a point is calculated on a Bezier curve. You can also create a mesh from a set of curves arranged in the form or cross-sections, also called profiles. You can access this option by selecting the curves, pressing space, and searching for Curve Profiles To Mesh. It is also available under the Object menu. This will have similar options to creating Curves To Mesh, but instead bridge edge loops between curves to create a mesh. 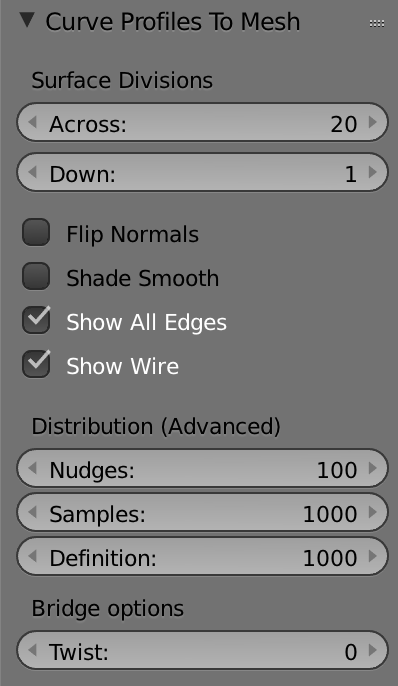 An additional option is you can set a Bridge Options -> Twist parameter, to control how the edge loops are connected. See the documentation for Bridge Edge Loops. I would like to create a mesh from one curve, for an example a letter, and fill in the faces afterwards. How can I do that? When the mesh is created from the curve, press tab to enter edit mode. Then, select all the vertices by pressing a. Then, press space and search for Fill. Ensure that the Beauty checkbox is selected in the options tab. How can I increase the precision of the even distribution of vertices? Try increasing the Samples parameter, which will increase the number of steps along the curve where the points are placed. This can have an effect on performance but the vertices will be better distributed. Does the Add-on work with cyclic curves that are joined up in a loop? When creating a mesh from 1 or 2 curves, cyclic curves are supported. For 4 curves, cyclic curves are not supported. Sometimes I try and create a mesh and it is too concave. What can I do? It is likely that the Fill operation does not have enough intermediate curves to define the surface well. This can often happen with shapes that bend around 90 degrees. I would recommend dividing up the shape more and creating some intermediate curves that can add more definition to the shape you are looking to achieve. If my curves do not interlock, will the add-on still work? Yes, mostly: the corner vertices are created by averaging the two points on a corner. If the curves a generally arranged in a 2x2 manner, the add-on may still create a mesh surface. How can I separate one curve into several curves? Select the vertices you wish to separate and press the 'p' key. This will separate that section of the curve into a new one. 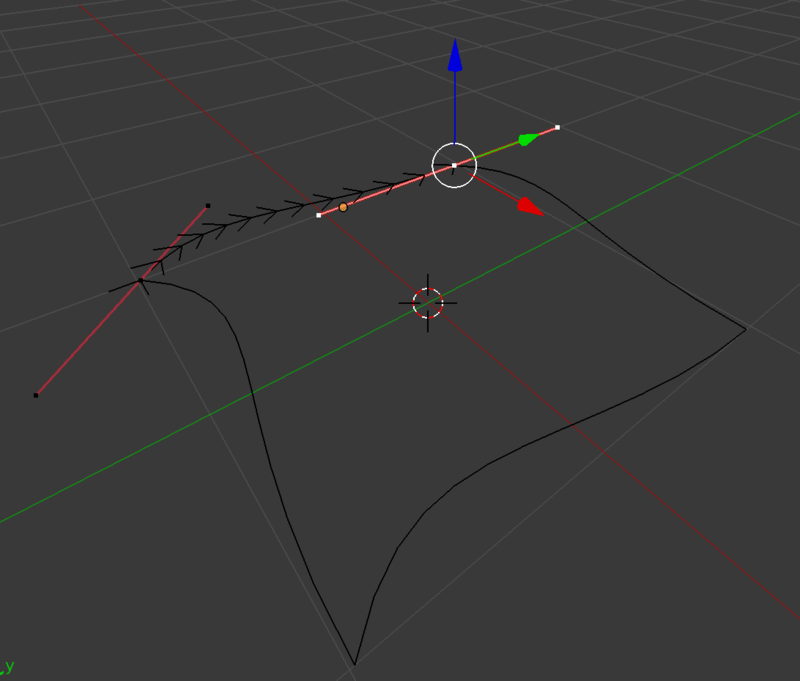 Can I make the vertices on the curve distribute more like a standard Bezier? 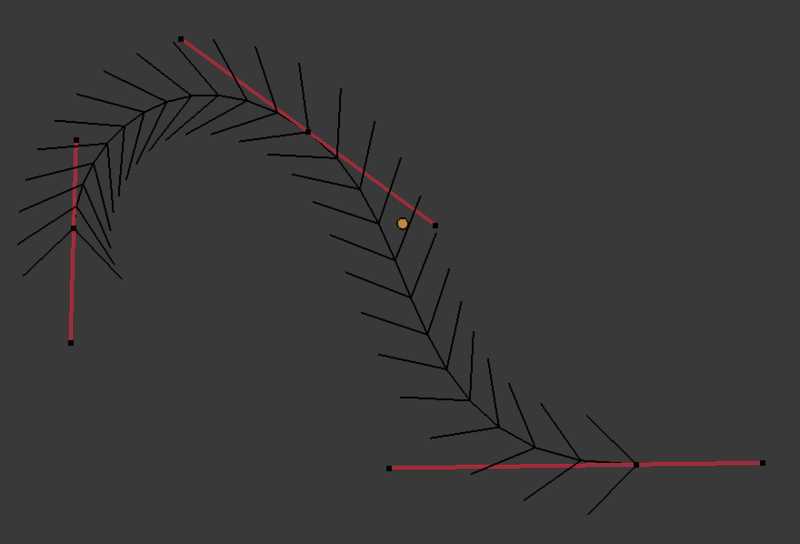 If you reduce the Nudges parameter to 0, the vertices should be distributed in a Bezier fashion. What types of curve does the add-on work with? The Add-on works with Bezier curves. Nurbs curves use different control points which do not interlock in the same way Bezier curve points do. Could you make the tool more interactive like a modifier? Unfortunately Blender only allows you to make Operators not Modifiers. Operators work in a one-time way. I may experiment with making a modal operator, which might allow you to change the curves and have the mesh automatically update. However when you click away from the mesh, the changes will still be permanently applied. Why can I not create a mesh from 3 curves? The add-on creates a mesh using quad faces that would not fit well into a triangular layout. If you wish to create a mesh this way, I would recommend you split one of the 3 curves into two. This will create a more uniform topology. This item has an average rating of 5 from 12 ratings by the community. FINALLY design is as always should had been. This addon enables you an almost-freestyle skecthing of everything you can dream on. IN QUAD-BASED RESULTS!!! Great addon. I bought it while ago and I work super great when modeling cars etc. Lookins forward for Blender 2.8 upgrade, because right now i doesn't work. Hi veezen, thanks so much for the great rating! There is now a new version that is 2.8 compatible ready for download to existing customers, there are instructions on the main page but contact me directly through Blender Market if you are having problems. Such a good and useful plugin. A real timesaver! super simple and best addon for modeling so fast or quick. creative addon. One of the keys to this add on is that it spaces points out evenly. 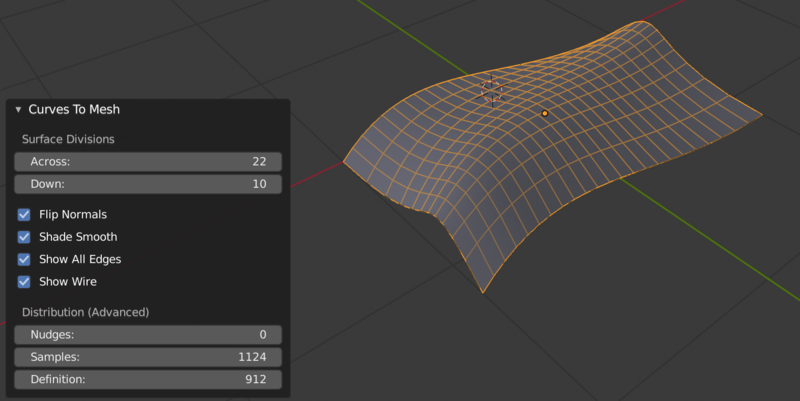 This is a lot more useful for Curves to Mesh than the default Blender option. Author is responsive and helpful. The add-on is great value for the price. In the beginning, I had an issue with using Add-on caused by my Blender’s settings. After a few hours of unsuccessfully trying to find the problem, I contacted Mark. He responded right away and instructed me what to do to fix it. Mark, many thanks for taking the time to help me out. This add-on is awesome. Super useful and time-saving. It is exactly what I needed. Love it love it love it! So simple, great topology and really easy to use. Obviously would be awesome to have it as a modifier but I understand there are some limitations with that. Nonetheless I appreciate that it creates the mesh as a new object and doesn't affect your curves, so depending on your project, adjustments shouldn't be too bad. I'm using this to wrap something around a foot, so being able to setup the path I visually like with curves first is just awesome. Cheers! This is a great addon, which has tremendously improved my workflow. 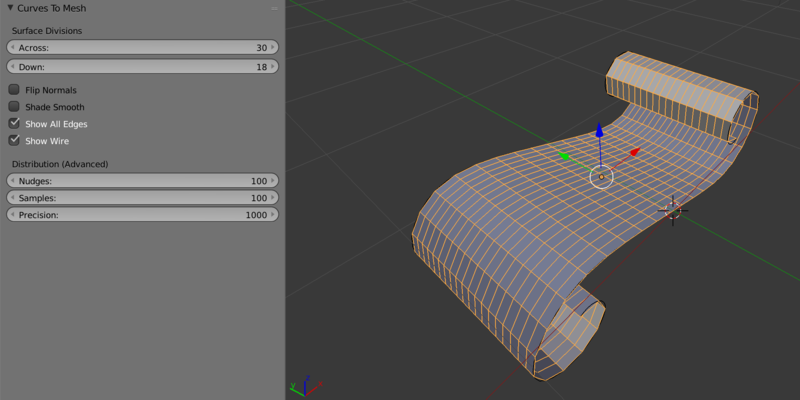 – For a long time I was looking for a way to loft a hull across several curves in blender. Now, due to this addon, it’s really convenient, to get back to the original curves during the modelling process, to control the form and make design changes, without having to work on the mesh itself, but by just adjusting the control points of the curves. A new hull can be generated at any time with the new 'Curve Profiles To Mesh’ function. The addon is running stable and working really neat, even on complex curves with a lot of points. It’s efficient and a real timesaver. – Great job, Mark! You are so genius and nice guy. I've been looking for such kind of plugin. I'm really glad to get this. By the way, it doesn't work with Text. I've been trying to use the command "Curve to Mesh" with Text, but it said, "You must select either 1,2 or 4 bezier curves". Also, I have a request. In "Curve profile to Mesh", I'd like you to add edge shapes to define. For example, now when I prepared 3 cycles and center one is smaller than the others, and do "Curve Profile to Mesh", the edges are so sharp and linear. In some case, I don't like this kind of result. Great add-on, very happy to see how quick the bug was fixed. Thanks for bringing it to my attention, it had slipped though the net! I was happy to jump on the bug. Awesome plugin that has so many uses! I love it! Thanks, and great to see it used in ways I hadn’t imagined.